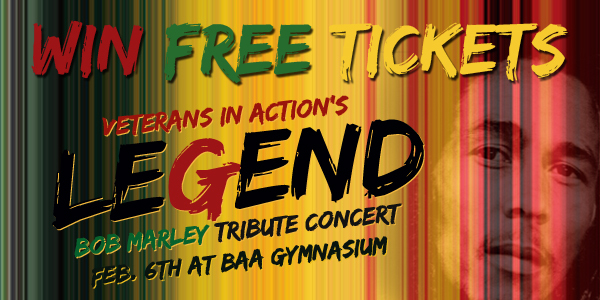 Veterans In Action is getting set to present a Bob Marley tribute concert on Saturday, February 6, coinciding with the reggae legend’s birthday, with Bernews set to giveaway 10 pairs of free tickets [total of 20] to the show between now and then, starting today. The concert will be presented by Veterans In Action Bermuda, in association with Carlsberg, and will be held at the BAA Gymnassium, with gates opening at 8.30pm. The show will feature artist Warrior King performing songs including “Never Go Where Pagans Go”, “Can’t Get Me Down”, “Jah Is Always There”, “Virtuous Woman”, and more, as well as Aaron Silk, brother of the late Garnet Silk, performing songs such as “Bless Me Oh Jah”, “I Am Vex,” and more. Local acts will include Live Wires, Skelly, Ramon Clarke, Rivah, and I-One, with music by Juggling J, Reality Sound, Bass Rider, Jonestown, and Culture Shock Radio with Blacks, Donnie, and Gibbo. For your chance to win a pair of free tickets to the event, keep an eye on the Bernews Facebook page, where we’ll be giving away tickets on selected days between now and February 6. When you see a post on the Bernews Facebook page asking a question about Bob Marley, simply be one of the first two people to answer correctly and a free pair of tickets is yours.